Offices can reuse and recycle in order to conserve paper. Paper conservation is a reduction in paper use to limit waste. This may pair with a recycling program to lower the amount of paper an organization sends to landfills annually. Along with paper, other goods can be conserved and recycled to cut down on waste over time. Organizations commonly target paper because it is a big area of waste in office environments and there are a number of easy tools available to reduce the amount of paper used. One approach to paper conservation is reuse. People may be encouraged to use both sides of documents, for example, or to make use of drafts and similar materials for scratch paper. This can limit the use of new paper for nonessential purposes, whether that paper is virgin or made from recycled fibers. It can also increase awareness of paper conservation because as people interact with reused documents, they may be reminded that they can also reuse paper to save resources. 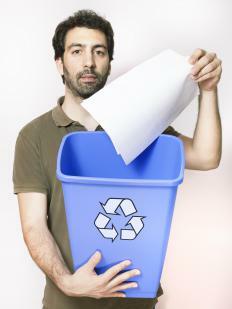 Going paperless, or radically reducing paper use, is another possible option. Many businesses can transition to digital files, for instance, and may offer digital billing to their customers. As an incentive to go paperless, people might be offered a discount or other benefit to encourage them to consider dropping paper bills. Paperless procedures can also include only accepting faxes and other documents in digital format, and creating a digital signing system for legal documents that require a signature from someone with a verified identity. This can extend to mailings and other communications as well. Government agencies accustomed to sending out hard copy data, for example, could maintain this information on a website and only send out paper materials by request. This can limit waste by reducing the amount of unsolicited paper mailings people receive on a regular basis. Similarly, coupons and promotions can be distributed in digital format for paper conservation purposes; users could receive a code on their cell phones, for example, to use in a store to receive a discount. People may be encouraged to consider paper conservation before recycling to reduce the overall amount of paper that needs to be handled. This can lower demand for new paper products and streamlines resource usage. If it is absolutely necessary to use paper, environmentally friendly options like recycled products or papers made from more renewable resources like bamboo are available. These can reduce the number of trees dedicated to paper production, while still being recyclable for use in new products. What Are the Different Types of Wildlife Conservation Careers?